I love Betty's. The pastel coloured cakes, the old fashioned staff uniforms, the beautiful Georgian exterior and the delicate china are just some of the things that make it special. Our friends Kevin and Lucie even picked the Harrogate site for their big day. Pretty as a picture and practically perfect in every way. The other day I received an email which physically made me 'eeek' with excitement! The wonderful folk at Betty's bakery had asked if I would like to review one of their cakes. 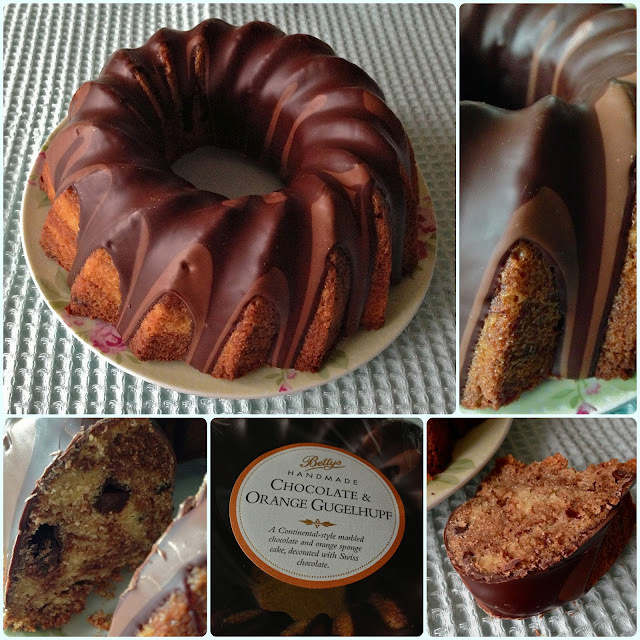 The lovely lady who contacted me had seen my obsession for all things 'bundt' and suggested that their Chocolate and Orange Gugelhupf may be in order. I've been excited all week. After having a bit of 'a day' today, my husband sent me a picture of a very special parcel that had arrived. Emblazoned with a pink Betty's logo... it was here! When I got home I literally fed the cat (out of fear for my own life) and then ran back to open my goodie box. A gugelhupf is very similar to a bundt really, both having the same historical origins in Europe, and generally having a hole in the centre. A gugelhupf is normally yeast risen, like a sweet bread or can be a marbled cake. Bundts are unique in the fact that their tins are made by Nordicware. This beautiful cake from Betty's is a marbled orange flavoured chocolate cake, covered in milk and dark chocolate. As I lifted it off the gold plate, I could feel that lovely stickiness on the base and reassuring weight to the cake. How I managed to resist long enough to take pictures, I have genuinely no idea! The kitchen was beautifully perfumed with chocolate orange. The second I had a decent picture of the cut cake, a slice had 'disappeared'. It's just beautiful! Moist, with a delicate flavour and big chunks of chocolate inside. I'd snaffled a slice within approximately ten seconds. If you're not yet brave enough to make a bundt cake, perhaps pop over to Betty's for a chocolate and orange gugelhupf? Even better, get on their website and order one to be delivered to your door! I'm definitely using this service in the future for birthday presents. Beats a bunch of flowers any day... They even split gifts by occasion to make life easier. I was very fond of Betty's before, but now I just adore them. Disclaimer: I was not paid to do this post. I was offered a complimentary cake to review on my site. I scoffed it, because it was genuinely ace. 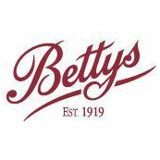 Love, love, love Bettys! It was a career highlight when I worked there as one of their Christmas seasonal staff many years ago after graduating! I would have loved that! I worked on a perfume counter when I was at uni! Swallowing down my jealousy right now ...! Gulp! On the flipside I think I just found this weekend's baking inspiration..
Have a look at my bundts page for loads of recipes! 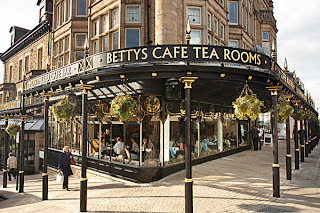 I love Bettys too - their cinammon toast was always a favourite of mine. although this cake looks gorgeous. Lucky you! It looks delicious! 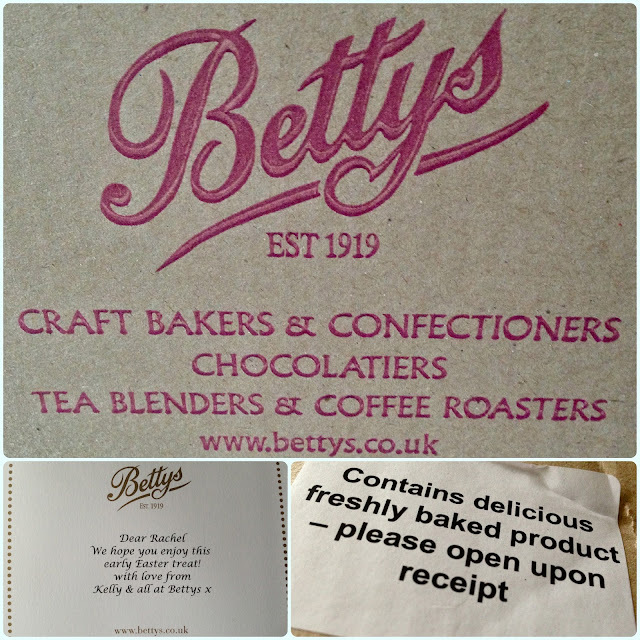 And you are making me want to make the trip to Betty's, that or order one of their cakes!